Hotsale R4iTT 3DS card. R4iTT 3DS card is the first 3DS flashcard from r4itt.net. It is the upgrade version of R4iTT 3D card. R4iTT 3DS is the first flashcard which break Nintendo 3DS console in the world. It perfectly supports Nintendo 3DS, DSi V1.4.1, DS,DS lite, DSiLL and DSi XL. As we know, the Nintendo 3DS console firstly released in Japan on Feb 26th. While the R4iTT 3DS card hacked the 3DS console on March 1st. Thanks to r4itt.net team, with their hard work, R4iTT 3DS can be used in 3DS within 2 days. * Perfectly support Nintendo 3DS, DSi XL, DSi V1.4.1, DS, DS lite. * Support Music, movies, E-book and otehr medias. * 1x R4iTT 3DS flashcard from r4itt.net. 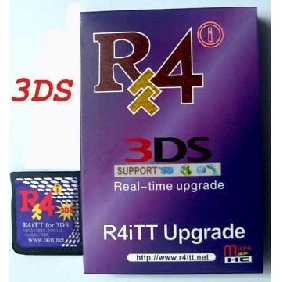 Attentions: R4iTT card with "3DS" mark is the R4iTT 3DS card, which can suppprt Nintendo DS, DS lite, DSi V1.4.1, DSiLL,DSi XL and 3DS console. The R4iTT card without "3DS" mark is the R4iTT 3D upgrade, which can't support 3DS console. Please pay attention to the packae before purchase. R4iTT 3DS is the first flaschard to break 3DS console. Support MicroSDHC: Yes, support most memory card up to 32GB. R4iTT 3DS software: R4iTT 3DS 1.0 Kernel.